Nikon's Monarch 5 vs 7. Which to choose? When comparing the Monarch 5 vs 7, we were anxious to get them side by side to see which one might be the better value. It seemed like a very natural question, when Nikon introduced the upgraded Monarch 5 using extra-low dispersion (ED) glass for the objective lenses, and changed the appearance of the Monarch 5's body to look nearly identical to the Nikon Monarch 7 . If money was a bit tight, but we could still choose between the two binoculars, which would we get? That question, friends, was the beginning of this comparison article! While Nikon has not officially changed the name of their Monarch 5 binocular since upgrading its optics to include the ED objective lenses, we've started calling it the "Monarch 5 ED" to differentiate it from the previous Monarch 5. In this article, we're likely to switch back and forth between the two names simply because it's easier to say "Monarch 5 ED" than to say something like "the new, upgraded Monarch 5" every time we refer to it! To Nikon, though, it's still just the "Monarch 5" binocular. As we say at the beginning of nearly all comparison articles, please don't base a decision only on this article written to compare the Monarch 5 vs 7. Here we'll focus only on those items which we believe are significant to such a comparison. In doing so, we're intentionally omitting a number of elements which are (or should be!) quite significant to anyone considering one or the other binocular, but which are covered in detail in the individual reviews for these two binoculars. Before giving strong consideration to either binocular, we urge you to read both of their individual reviews. Having gotten those things out of the way, let's get started with this Monarch 5 vs 7 review then, shall we?!? Since upgrading, you'll notice in the pictures that the Monarch 5 ED's body is remarkably similar to the Monarch 7's. The obvious differences are gone and a person now has to read the model number on the front of the rubber armoring or what's written on the "face" of the focus wheel. What it says on the face of the focus wheel doesn't make it blatantly obvious, but the angular field of view is printed on both focus wheels. The Monarch 5 ED's angular field of view is 6.3° for the 8X42 configuration, while the Monarch 7's is 8.0° for the same configuration. Keeping in mind that the larger angular field of view will apply to the Monarch 7 for a given configuration will help to correctly identify them if the front view of the binoculars is obscured. The Monarch 5 ED is slightly taller than the Monarch 7 and its focus wheel is not quite as thick as the Monarch 7's, however those are design elements which don't make much difference in the quality of construction or the ease of use. The weight is slightly more for the Monarch 5 ED than the Monarch 7. The difference for the 8X42 configurations we tested was specified by Nikon as 2 ounces or 56 grams. Is that enough to make a significant difference? Perhaps, for some, it could be. Having said these things, we're pressed to find significant differences between the build of the Monarch 5 vs 7. With the very small amount of space devoted to the differences in the construction above, one ponders what we might have to say about their optics! Actually, this is where we were the most fascinated by what we found…and where the significant differences and similarities that decisions should be based on really come out. First, we already referred to the differences in field of view when we noted above that they're printed on the faces of their respective focus wheels. The Monarch 7 has an 8.0° angular field of view as compared to the Monarch 5 ED's 6.3° in the 8X42 configurations we bought for review. The difference in the field of view's width for our 8X42 configuration binoculars amounts to 90ft (27.5m) — that's a significant difference to start with, but let's explore it further and see if that difference holds up. What we found (and wrote up in their individual reviews) was that the field of view for our test Monarch 5 ED binocular started to perceptibly blur at about 64.3&percnt; of the radius of its 329ft (110m) field of view, but our Monarch 7's view didn't begin to perceptibly blur until about 71.0&percnt; of its 419.2 (127.8m) field of view. That means you get 86ft (26.2m) more in a well-resolved field of view with the Monarch 7. That's a difference that will be sufficiently significant for some to make a decision without considering a great deal more. Does that initial 90ft (27.5m) difference hold up under further scrutiny? Yes — it certainly does! We love a broad field of view — it makes the view beautiful and can at times make us forget that we're looking through optics and don't actually have a "ring-side seat." You'd expect us to fawn over the larger field of view and we'll not let you down. The useable field of view makes a huge difference in one's enjoyment of optics. If something occurs outside of your binocular's field of view, you're likely to be oblivious to it simply because there's usually nothing to alert you to it. We'll leave it at that. One thing that surprised us and, while it's not a difference between the two models, we feel obliged to include it in this comparison. Something that is significant to many binocular users is their ability to use the optics in low light conditions. We're no different. However, we felt confident that when Nikon upgraded the Monarch 5 binocular's optics, the brightness of the view would have remained relatively unchanged. We felt this would be true even though upgrading the reflective prism coatings (which were already a lower-grade dielectric) to make the view brighter would enhance the colors and resolution of details viewed and thus make the difference between the non-ED model and the upgraded model with ED lenses even more apparent. In other words, adding more dielectric coating layers to enhance the Monarch 5 ED's optics it would be a real bonus to the user — but we felt confident that Nikon wouldn't do it. An element that we'd not counted on was the competitive element with a new binocular entry to the marketplace. Many consider that the upgraded Monarch 5 (and its price point) is a direct response to the entry from a well-known German optical company and, if that were the case, it would mean pressure for Nikon to make the new Monarch 5 ED as bright as that competing binocular. Perhaps you can imagine our delighted surprise when we found that the brightness of our Monarch 5 and 7 binoculars was so close that we were unable to perceive a significant difference in very low light conditions! We're confident that this means that Nikon increased the number of reflective dielectric coatings applied to the Monarch 5 ED's prisms to be approximately equal to the Monarch 7's. This competition has produced a definite win for binocular users! When using the binoculars in low light situations, we noted that the Monarch 5 ED didn't control light from off-center sources as well as the Monarch 7 did. We wouldn't say that the Monarch 5 ED performed poorly — just that in a Monarch 5 vs 7 comparison, the 7's performance was a bit better. Interestingly, the rain guard for the oculars and the covers for the objective lenses seem to be identical between the Monarch 5 ED and Monarch 7. It's a welcome step up for the Monarch 5 ED, for which the previous lens covers were not as user-friendly. These are two very good binoculars. The Monarch 5 ED's upgrade in terms of the quality of its objective lenses and reflective prism coatings has improved the optics to be, except for the field of view, very similar in quality to the Monarch 7. If price were not a consideration, we would quickly choose the Monarch 7 because it effectively provides a "picture window view" with it's 8.0° angular field of view and generously wider sweet spot. 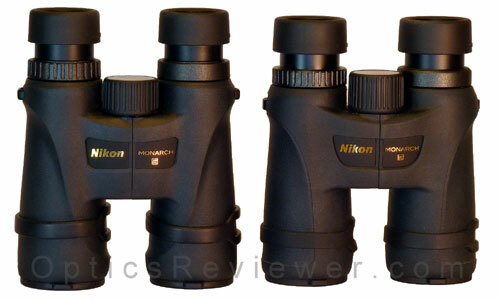 These links will take you directly to the selection of Monarch 7 binoculars on Amazon.com and Amazon.co.uk . Having said that, if we were in a position, as we have been from time to time, of needing to be careful money managers, the performance of the Monarch 5 ED binoculars is very good at two thirds of the Monarch 7's price at the time this article is written and we would enjoy very much using the Monarch 5 ED. These links will take you directly to the selection of Monarch 5 ED binoculars at Amazon.com and Amazon.co.uk . 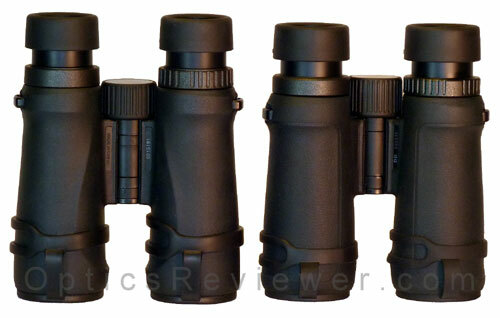 The individual reviews discuss each of these binoculars in much greater depth than this comparison. We recommend reading each of them (the Nikon Monarch 5 review and the Nikon Monarch 7 review) carefully before drawing a conclusion as to which instrument might better serve your interests.